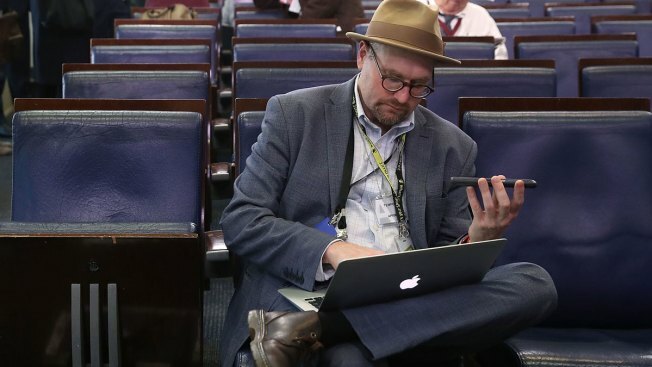 The Times, in a statement, said "the alleged behavior is very concerning" and not in keeping with the Times' standards"
In this file photo, New York Times reporter Glenn Thrush works in the Brady Briefing Room after being excluded from a press gaggle by White House Press Secretary Sean Spicer, on February 24, 2017 in Washington, DC. McGann, who was an editor at Politico, said the incident happened five years ago at a Virginia bar that was a hangout for Politico employees. The incident made her angry — even more so when she said Thrush spread stories blaming her — and she interviewed other women about him. But he said he was "deeply sorry" for another event that happened last June involving another woman, not identified in McGann's story. In this case, the woman became upset when Thrush began kissing her on the street after they had been in a bar. Thrush said he hasn't had alcohol since the event, which he called "life changing." Thrush is also a contributor at MSNBC. The network — owned by this station's parent company — said he has no scheduled appearances and it is awaiting the outcome of the Times' investigation. A spokeswoman for the publisher Random House, where Thrush has a deal to co-write a book on the Trump presidency with Times colleague Maggie Haberman, said the company is looking at accusations "closely and seriously."